Inner riches released. Inner magic. Go from bottled up, to creative development, developing potential, self discovery. At the Creativity Emporium. more inner riches, inner magic. one more step to a fuller richer life. then The Creativity Emporium and the FREE updates are for you. If its's not right for you, you can cancel immediately. Guaranteed. Most people have much of themselves bottled up, only partly expressed, only partly developed. I know that all too well. This has been one of the largest challenges in my life - releasing the inner riches, getting them to flow freely instead of just in bits here and there. You have it so much, I was told over and over. But I knew there was a huge amount I couldn't get out. Blocked creativity. Staying in work way too limited for me. Unable to get an audience for what I did write and paint. Many people have parts of themselves locked into a tiny box – especially parts to do with good thinking. So many thoughts are taboo, undeveloped, such as thoughts that violate common rules and nice liberal beliefs. No one has the right to think that! It’s off limits! The thought police, internalized, stand guard day and night. Yet most of the time, people are even unaware of the cops. It’s only by the outcome that they catch our attention – like an invisible planet with a huge pull, like a black hole that swallows all. This was a better area for me - but here I came up against another wall. How could I get people to hear what I was saying? I had so much empathy for Al Gore - An Inconvenient Truth - 20 years of struggling to get his message heard. Emotionally too, so many people live lives way smaller than they need to be. Depression haunts so many lives. I’ve read a study saying that fully one-third of North Americans wake up depressed. There’s so much talk about how people are running scared because of economic depression. What about the costs of such an enormous emotional depression? Emotional poverty. What is the Creativity Emporium, that it could work against such powerful forces? Controversial questions addressed with good thinking skills - stimulating, invogorating, liberating. Inner riches expressed - spoken word, poetry coming from every emotion, bringing alive moments. The benefits? Greater aliveness - greater emotional aliveness, greater mental aliveness. How? It stimulates thinking. Loads of good thinking all around at the creativity emporium – it's a gym for the brain. Like any gym, it can’t make people do anything they don’t want to. So some people, at a gym, just see bits of nasty equipment. Others come to love the pleasure of the workouts – and their lives change. 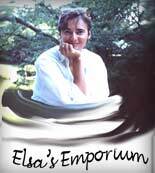 The Creativity Emporium also opens up feelings – of grief, love, loss, anger. It brings you more to life. And again, like with a gym, the words can’t do it on their own. You have to approach, listen, hear. You have to take time. That brings me to the updates. New pieces, new creativity and thoughts. And then, the updates. The web is huge, huger than the largest city on earth. It's teeming with millions of sites. There is no steady geography. The landscape keeps shifting. Even if you search for exactly the same thing, what you get is different. Also, life is so crowded, so packed with things to do. Without the updates, the Emporium is gone for you. Added bonus: FREE access to the Members Only pages. The Creativity Emporium - thinking riches, creative riches, fun riches, deep riches, frivolous riches - from rhinestones to touchstones - each bubbling out to flow into the world. You never know what you'll find next, but you know ... stimulation, energy, pleasure! Riches on many levels, touching the riches within you, increasing your own inner wealth. Inner magic. It's so easy to lose touch with the riches within, not discover much of our own inner wealth, live cramped lives with walls that keep out sun and wind, thought and emotion. The Creativity Emporium - a home wide enough, large enough, with space to breathe deeply, to relax and let the thoughts and feelings flow.